Lyon in the department Rhone has become my new favourite city since living in the Haute Savoie. How lucky was I to find myself living in the Rhone Alps region of France only an hour and a half from the gastronomic capital of France. There are some 3500 restaurants in Lyon including the famous Bouchon district in the old part of the city (le Vieux ville). 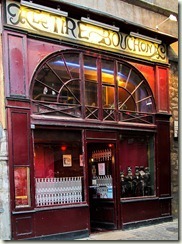 A Bouchon is a type of restaurant in Lyon, serving traditional Lyonnaise cuisine. The dishes are mainly meaty, full fat and all parts of the animals. These restaurants are normally small, family run and have a great warm, friendly atmosphere in a traditionally decorated style. Typical dishes you would expect to find would be Fois gras, salad lyonnaise, boudin noir (blood sausage), Oeufs Meurette (eggs poached in a red wine sauce). Onglet de boeuf, tablier de sapeur (tripe), Rognons de veau (veal kidneys). The culinary delights found in a Bouchon are more substantial dishes, using fats and big flavours; not the French nouvelle cuisine that Lyon has become known for since the 1960s mainly thanks to the world renown chef Paul Bocuse.